Copper dropped to an eight-month low in London Monday as shockingly weak Chinese trade data fuelled investors fears beyond what the ongoing crisis in Ukraine already has. China's exports sank 18% in February, swinging the trade balance into deficit and pushing three-month copper on the London Metal Exchange down 1.7% to $6,663.75 a tonne. Prices for the red metal went down as much as $6,608 a tonne, the lowest in seven months. In June 24 last year prices for the commodity dove to a mere $6,602, the lowest since July 2010. 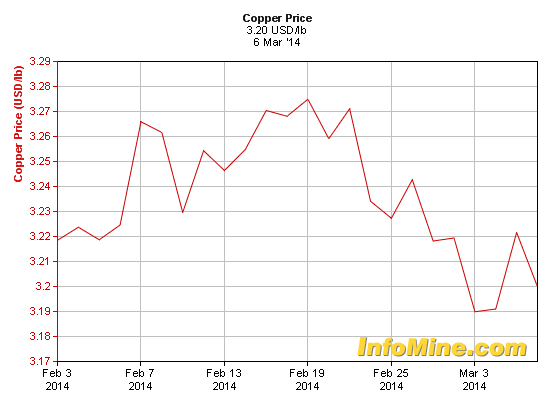 Shanghai copper, in turn, went down beyond its 5% daily limit on Monday, hitting its lowest in more than four years. Given its widespread use in transportation, manufacturing and construction the copper price is sensitive to any economic slowdown. China is responsible for 42% of total global copper demand of some 21 million tonnes and the country's PMI data is particularly closely correlated to the copper price. To make things worse, Edinburgh-based researcher Wood Mackenzie Ltd. is predicting copper output will exceed demand by about 300,000 metric tons in 2014, from 65,000 tons last year. Freeport-McMoRan Copper & Gold (NYSE:FCX) warned in December it might have to declare force majeure on concentrate sales from its Grasberg mine in Indonesia due to new export rules. The Democratic Republic of Congo ordered mining companies to halt project expansion requiring high levels of power amid a shortage that will take years to resolve. Workers went on strike last year at Codelco’s Salvador mine in Chile.